Mad Pride Toronto celebrates pride and empowerment, community and culture and You. Join in the advocacy, music, art, food, yoga, and the Bed-Push Parade! Mad Pride reclaims terms and challenges prejudices. Call us crazy, ill, psychiatric survivors, consumers, mad people, and normal! Mad Pride is pride in an identity of madness rather than shame. It is a refusal to accept limiting diagnoses. 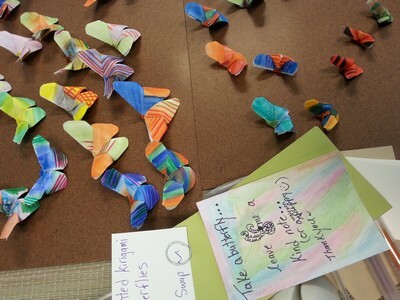 It is a celebration of different mental states, experiences, and even mental distress. "Madness" is used to cover a number of terms often used pejoratively by doctors, institutions, society and even ourselves. Mad pride demands more than patronizing treatment, tolerance by society, or anti-stigma campaigns. We strive for pride! We strive for self-determination. We strive for a society where differences are recognized as part of living together. Mad Pride does not have a single definition. Even the planning group members use different terms to define their "mad". Some of us use medications and some hate psychiatrists. The key is that we are striving for a world where everyone in society will be healthier and better off. 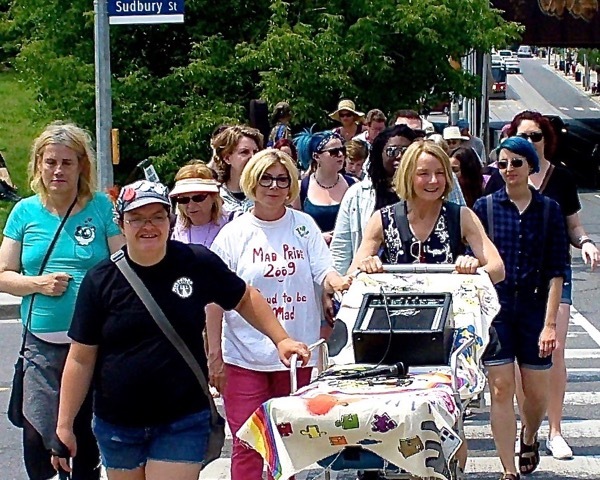 Mad Pride pioneers in Parkdale, Toronto, fought to challenge the stigma of mental illness by advocating for those who experienced prejudice as a result of their psychiatric histories. As a mental health advocacy movement, Mad Pride activists want to redefine “mental illness” to promote empowerment and to change the way we all think about mental health. Similar to how LGBTQ+ communities have reclaimed the term “queer”, Mad Pride activists seek to reclaim language that has been used as a tool of social ostracism. When we reclaim terms like “mad”, “nutter”, “crazy”, “lunatic”, “maniac”, and “psycho”, we feel a sense of solidarity, rather than alienation. Reclaiming language is political and challenges discrimination. Mad Pride participants use and refuse a variety of labels. We choose “mad” as an umbrella term. By supporting the Mad Pride movement with your donation, we will be able to continue the work of the original Mad Pride activists. Mad Pride Week reaches hundreds of Mad people, allies and the public. We will also be able to carry on community building activities throughout the year. While we do have a yearly cultural event in Toronto where we come together to share our experiences, strength and hope, Mad Pride activism can also be seen in academic spheres. Mad Studies are a crucial part of our history, as they have brought us to a better understanding of mental illness and madness as a whole. How will we be using your donations? If you choose to support us, we will be able to grow our annual cultural event, which is world renowned for the bed push protest. The bed push protest is a statement that we are reentering the the community. Let people know that our summertime event is more than just about pushing a hospital bed! It’s about mad people and allies getting together to celebrate madness! Other events include skills-learning workshops, craft markets, performance art and social gatherings. provide free food, drinks and goodies at events including the tea party! No donation is too small! Know that every little bit helps. We are so grateful that you have visited our page and shown interest in our growing movement. We hope to see you in July for our Mad Pride 2016 event. There will be workshops, parties and parades galore! If you have any questions about what we do at Mad Pride, please contact us at torontomadpride@gmail.com.